Take Back The Filter: 05/15/2008: Escaped BRITA filter needs your help to get across San Francisco this Sunday! Send us your used filters! 05/15/2008: Escaped BRITA filter needs your help to get across San Francisco this Sunday! 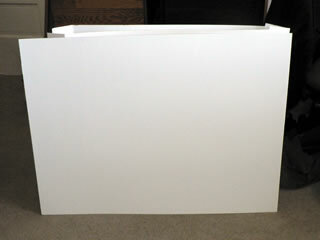 This may look like ordinary white poster board, but in a few days it will transform into a BRITA water filter costume I'll wear to cross San Francisco at the ING Bay to Breakers this Sunday in an effort to publicize the campaign to a wider audience. Thing is, I can't do it alone! I'd love to have at least one volunteer to help pass out flyers along the route. More volunteers would be even better. Let's create a last-minute team of folks wearing www.takebackthefilter.org signs on their fronts and backs and helping the BRITA cartridge escape the landfill. Please e-mail me at beth@myplasticfreelife.com if you're interested in participating this Sunday. It'll be fun! Looks great to me as well. Hope you can find some volunteers. I'd love to help - unfortunately, I'm even farther away in lovely Central IL. I guess I could see if I could get my friend who lives in San Fran to do it... Trying to figure out if she'd be interested or not really. I'll think about it some.